Crisp, light, refreshing with a unique natural taste is what I found when I first tasted Kristian Regale sparkling juice. I am not a fan of wine, but still want to be able to join in on those special occasions that need a wonderful glass of a sparkling drink to toast with. I was super thankful to have had the privilege to taste all 6 of the Kristian Regale sparkling juice flavors… apple, pear, lingonberry-apple, peach, pomegranate-apple, and black current. I had a hard time picking a favorite from all of these delicious flavors… they were all so wonderful! If forced, I would have to pick peach as my favorite though. 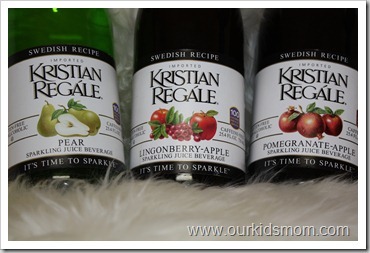 Kristian Regale is a sparkling juice that holds onto it’s fizz. We opened a bottle but were unable to finish it so I put it in the fridge. A few days later I went for a glass and when I poured it, it was still as bubbly as the day we opened it. Being a non alcoholic drink we are able to bring it out at any family gathering, special occasion, or just at supper time with the family. Having kids, if I poured an alcoholic drink they would want to taste it. I would always have to tell them “No this is an adult drink, you can’t have this”. They just wanted what we were having and I would feel badly. Now when I bring out a bottle of Kristian Regale I am able to share this wonderful taste with the kids. They felt so proud to be able to drink the same special drink as mom and dad. 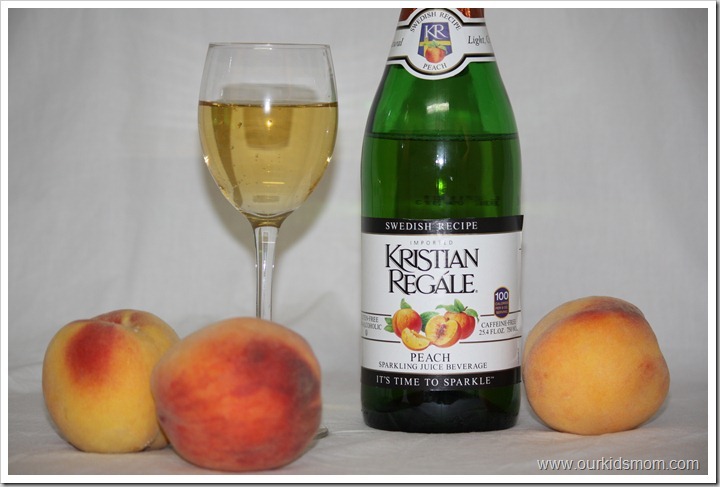 Kristian Regale has made a wonderful tasting sparkling juice with a amazing affordable price. 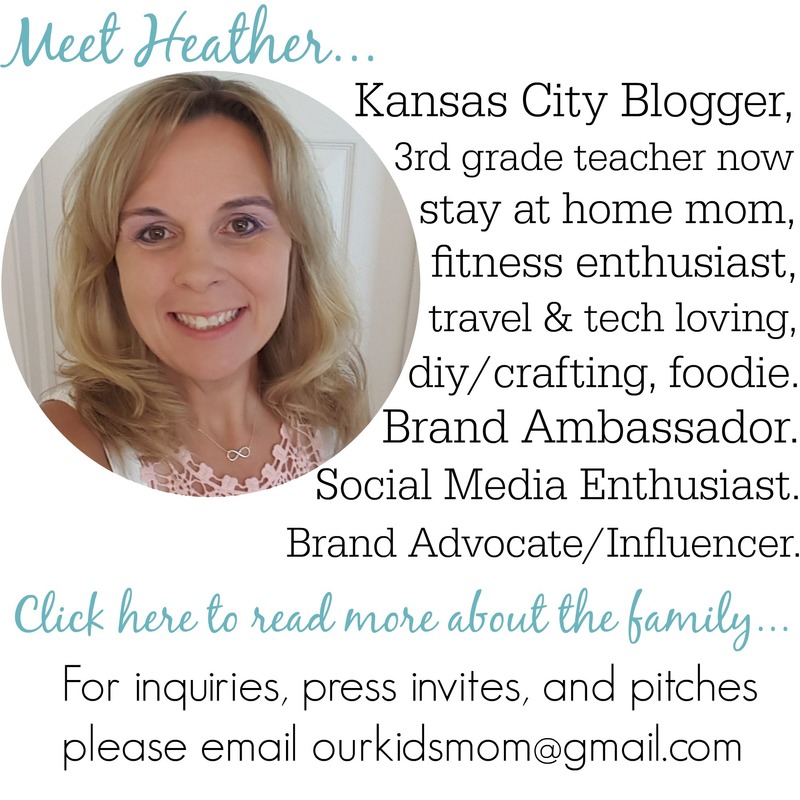 ONE OurKidsMom reader is going to win a box of all six flavors! This giveaway ended at 11:59 PM EST on August 21, 2012. I learned that these drinks have no fat or cholesterol.. thanks! I would like to try the BERRY PINK FRAPPÉ recipe. I learned that I could buy it on Amazon. I’d like to try the Peach Sparkler; it sounds so refreshing. The Ligonberry-Apple is made with real lingonberry juice from Sweden! I really want to try the ligonberry-apple. I’d like to try the Peach.. One of my favorite flavors! I would like to try the black current. The black current sounds really good! They started their company in 1988. I just love that they are alcohol free…they all sound delicious!!! They have some yummy recipes on their site! 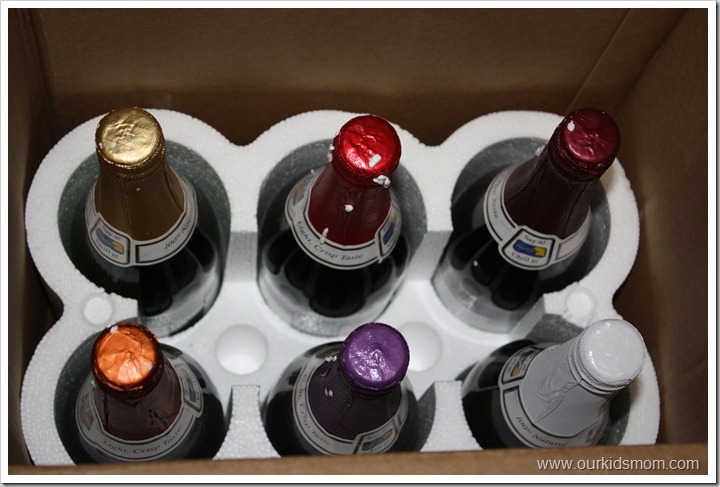 I would love to try their Black Currant Sparkling Juice – I love the sparkle! Nice cold weather and holiday drink for a group. In large electric coffee maker, combine first four ingredients. In coffee maker basket, place cinnamon sticks, cloves and orange slices; perk according to coffee maker directions. When finished perking, remove basket; discard contents. To Serve: Pour into clear glass cups with handles; garnish with cinnamon sticks, if desired. Amount: 18 (1 cup) servings. Tip: If a large electric coffee maker is not available, the cider drink can be made in a large stock pot. Combine all ingredients; heat on stove top. I learned: The brewery was importing a special concentrated apple syrup from Sweden to make the cider. Following the traditional Swedish recipe, this all natural, non-alcoholic sparkling cider had a refreshing light crisp taste. I love that they have 6 different flavors and they all look good. I want to try the pear…this would be fun for New Years Eve! I absolutely love the idea of these! So fun.. love they are non-alcoholic drinks and have no fat!! Loved the recipe section too.. the APPLE CINNAMON FLOAT sounds yummy! The Lingonberry-Apple sounds very good to me! I learned how to make a POMEGRANATE RED SPARKLER. YUM!! They have floats,frappes and smoothies.The apple cinnamon sound tasty. I like the fact that they include recipes on the website that actually sound like something you’d want to add to a special occasion! I want to try the Pomegranate flavor! I like that the sparkling juices. I love the list of recipes for frappies, smoothies, and floats. Thanks Lindsay! Sparked by strong marketplace health and wellness trends, consumer interest in all natural, non alcoholic sparkling juices like Kristian Regále has continued to increase. Consumers are looking for healthy, all natural products without preservatives or artificial flavors. I learned that I can buy it on Amazon. I’ve only tried the pear, which for adults, is great with prosecco. Would love to sample the rest! They have a recipe for RED HOT CIDER that sounds delicious for this upcoming fall season. I learned that the Lingonberry-Apple Sparkler is made with real lingonberry juice from Sweden. I’d like to try the pear flavor. Loved the party drinks recipe for red hot sparkler! The Ligonberry-Apple is made with real lingonberry juice from Sweden! I would love to try that. I’ve tried the pear but didnt know there were other flavors! 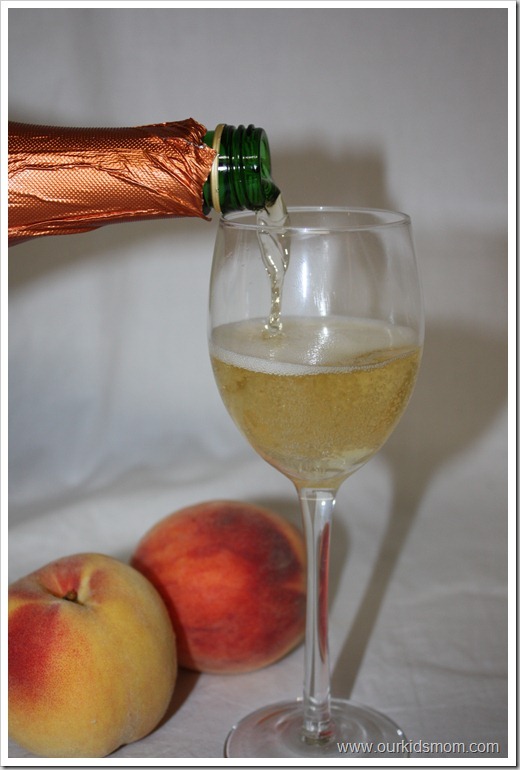 The peach sparkler sounds delicious. I would love to try. I want to try the recipe for POMEGRANATE RED SPARKLER. They have some fun recipes which I would like to try including CRIMSON SIPPER. I love this stuff. Perfect for brunch and the holidays coming on fast. I have to try the pear. The peach flavor sounds yummy! I like that Kristin Regales provides sober people with an alcohol free alternative to champagne. The Pomegranate Apple sparkling juice looks interesting! I would like to try the APPLE CINNAMON FLOAT drink recipe. I need to try the Pomegranate-Apple flavor! I would like to try the Kristian Regále Lite which has 2/3 Less Sugar and 2/3 Fewer Calories! I love the sound of Lingonberry-Apple. This just sounds so yummy. I want to try it. Thanks! 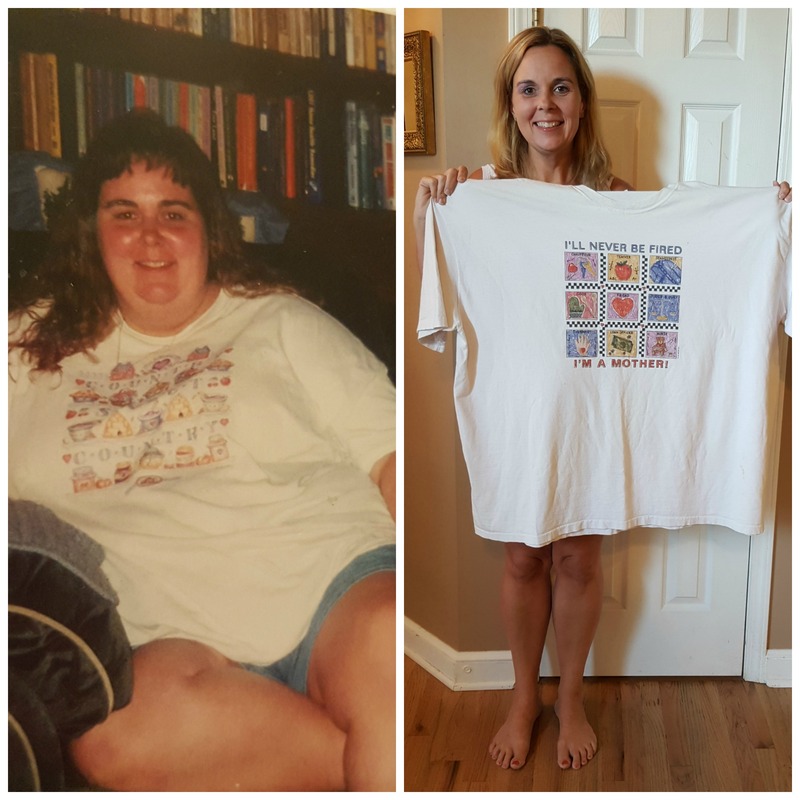 I learned the ingredients are all natural, which is something very important to me! I’d like to try using it to make the APRICOT GOLD SPARKLER recipe. I really want the peach…I know my husband would love it too! I like the KRISTIAN REGÁLE NATURAL. their berry pink frappe recipie sounds delicious! I learned that the company also makes a line of light sugar juices for diabetics…made with splenda. I want to make the APRICOT GOLD SPARKLER. I like that they have recipes on their site for different drinks to make. They all look really delicious! No fat, no cholesterol in these drinks. I learned that the juice is offered in seven different flavors. Thanks for the giveaway. 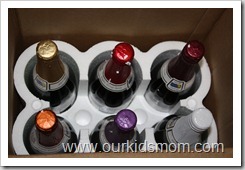 I love the party drink recipies…I think I need to try that crimson one! I really want to try the peach! The PEACHY FRAPPÉ recipe looks divine! I learned that Kristian Regále is available in 7 flavors. Looks like great drinks, I would like to try the black currents flavor. I learned that you can buy on Amazon. I learned that they have a lingonberry apple. I really want to try that. I am used to just white sparkling grape juice. I would like to try Lingonberry-Apple Sparkler. I learned you can buy Kristian Regale on Amazon. 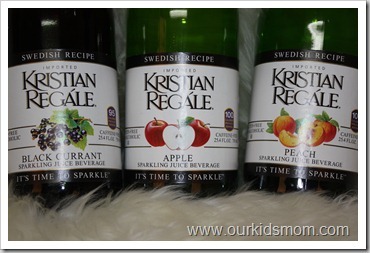 I’m usually a Martinelli’s girl, but I love the variety of flavors at Kristian Regale, such as Pear and Peach. Glad to hear! We also have less calories & less sugar then Martinelli’s! Enjoy! Amazing, didn’t know it could be used in smoothies. We’re big smoothie makers so now we have to try this product. I love the POMEGRANATE RED SPARKLER recipe! I like the great fruit flavors Kristian Regale offers! I want to try the Peach flavor! The pear flavor sounds so good to me! 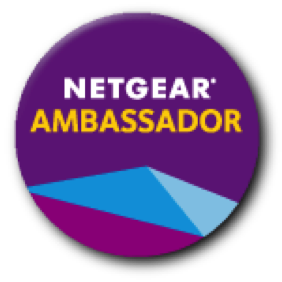 I learned that the company is located in Paramus, New Jersey. I would love to try the Peach or Pear flavors! I would like to try the Ligonberry-Apple drink because it sounds interesting. The PEACHY FRAPPÉ sounds, well…. PEACHY!! What a great idea. I’m sure that this adds quite a kick of flavor! I learned where Lingonberry’s are grown. I had never heard about them before. I like cranberries so I think it would be interesting to try. I’d like that there are drink recipes. I really want to try peach!! I like the recipe for the BERRY PINK FRAPPÉ! The recipe for APPLE CINNAMON FLOATS sounds super yummy! Id like to try The Apple Sparkler!!! I would love to try the sparkling peach juice! I just had a baby 3 weeks ago and am breastfeeding, so I cannot have any alcoholic beverages; sparkling juice is the next best thing! I like that the sparkling juice is fat free! Would love to win some and try it! I learned that they have 6 different flavors. I want to try the pomegranate apple flavor! I love that they have several yummy flavors and no fat in the drink in a great perk. With the upcoming cooler weather I like their suggestion of the recipe RED HOT CIDER that uses several of their sparkling varieties. I think the Peach flavor sounds good. It is non-alcoholic and I like that. I really like the FRUIT FILLED ICE RING recipe! I can’t wait to try it! I would love to try the peach! Love anything peach flavored. I like the Peach Sparkler. I just learned that they made a lite version in apple and pear. I like that they have recipes on their website. I’d like to try the PEACHY FRAPPÉ. The company was started in 1988! I want to try the Black Currant Sparkler because I don’t know what it is.